Mushrooms are often used in cooking various delicacies. They can be baked, dried, canned, and cook on the grill. There are many original, at the same time, no complicated recipes. dry rosemary, salt and pepper to taste. Take the garlic, peel and chop carefully, mix it with salt, fragrant rosemary and pepper until blended. Then add vegetable oil, all mix thoroughly. Mushrooms wash, slightly dry, cut off the legs, and hats, place in a bowl with the mixture. Leave the mushrooms for 45 minutes. Then fry them on the grill for 6 minutes on each side. Before serving, sprinkle the dish with chopped greens. Mushrooms thoroughly wash, dry and clean. Make a marinade. In a deep bowl, combine mayonnaise, ground black pepper and salt. Then put the prepared mushrooms in the mixture. Domainwide them about 35 minutes. 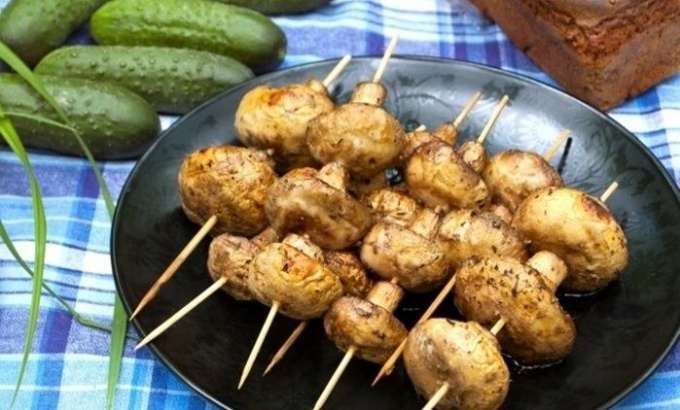 Put the mushrooms in skewers and bake for 25 minutes. Prepare the sauce. In mayonnaise squeeze the peeled garlic, add salt pepper and chopped parsley. The resulting mushrooms will transfer to a separate plate lined with lettuce leaves, top, pour all the sauce. - salt, pepper and fragrant rosemary to taste. Wash the mushrooms, place on paper towel to drain. they are a little. Slice the mushrooms to a small plate. Then, peel garlic, squeeze it through a press, mix with salt, rosemary and pepper. In the mixture put the mushrooms, stir, leave on for 10-15 minutes, so that it is marinated. The grill pan thoroughly grease with vegetable oil, put back the mushrooms and fry them for 15 minutes. The resulting dish, sprinkle with chopped herbs. - pepper, salt to taste. Wash and clean mushrooms. Separate the stalk with a part of gentle flesh from the cap. Make the stuffing. Peel the onions, chop. Rinse tomatoes and cut into small slices. All this mix. Then add chopped pieces of cheese, turmeric powder, whipped cream, ginger, paprika and garlic. Add salt and pepper to taste, and stir. Then fry the pieces of bacon in olive oil. Connect the filling with the bacon and gently fill the mushroom caps. Received the mushrooms cook on the grill approximately 15 minutes until fully cooked. Decorate the finished dish with sprigs of fragrant thyme.